Jens Voigt (Saxo Bank) clinched the 62nd victory of his career in a powerful uphill sprint against Estonia’s Rein Taaramae (Cofidis) in stage four of the Tour of Catalonia. 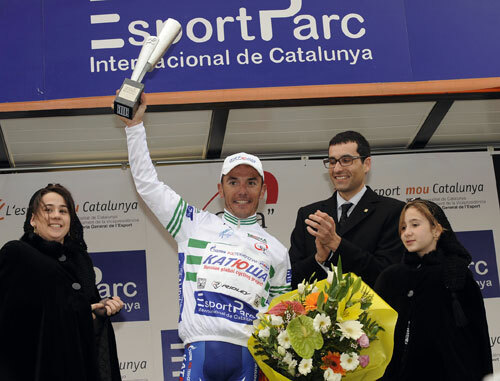 Joaquin Rodriguez (Katusha) remains overall leader. Voigt was able to secure the win after breaking away on the second ascent of a second category climb close to the finish in the town of Ascó. Joined by Taaramae closer to the summit, after Kreuziger lost contact on a dangerous corner, the two tackled the fast descent into Ascó with less than a minute’s advantage on a two-dozen strong group of chasers. Then in a steepish uphill charge, Voigt easily saw off the Estonian. For Voigt the victory was his first since his terrible crash in last year’s Tour de France at speeds of 80 kmh on an Alpine stage, fracturing his cheekbone and suffering severe concussion. He later said his helmet had saved his life. “I don’t really think about it that much, to be honest it’s more important that I have won at least one race every year of my career – and this is my thirteenth,” Voigt – now a sprightly 38 – said later. With more than half of Catalonia now behind them, Rodriguez remains in control but with only a slender 10 second advantage over stage three winner Xavi Tondo (Cervélo). Stage five from Ascó to Cabaces is probably the hardest day the Katusha pro will face. With barely a metre of flat and a second category climb close to the finish, Rodriguez described the final run-in to Cabaces as ‘lethal’. Should he come through intact, though, the Spaniard can start thinking about his first stage race victory since the (now defunct) Catalan Week back in 2003.